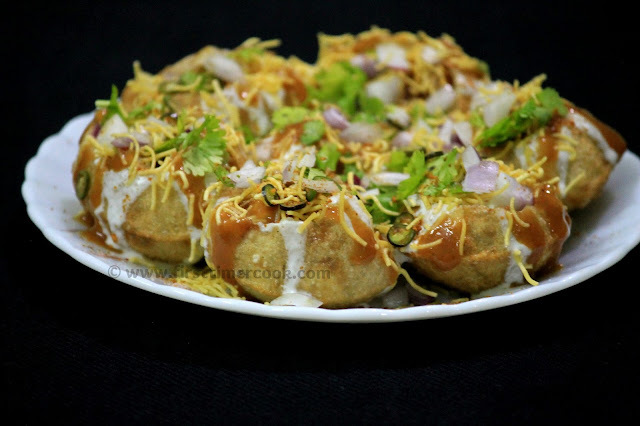 Golgappa is a common street snack food in many regions of Indian subcontinent. It's really so hard to find anyone who doesn't like golgappa. This snack item has different names as golgappa or puchka or panipuri or gupchup in different regions. But whatever the name be, this street snack food is loved by everyone. 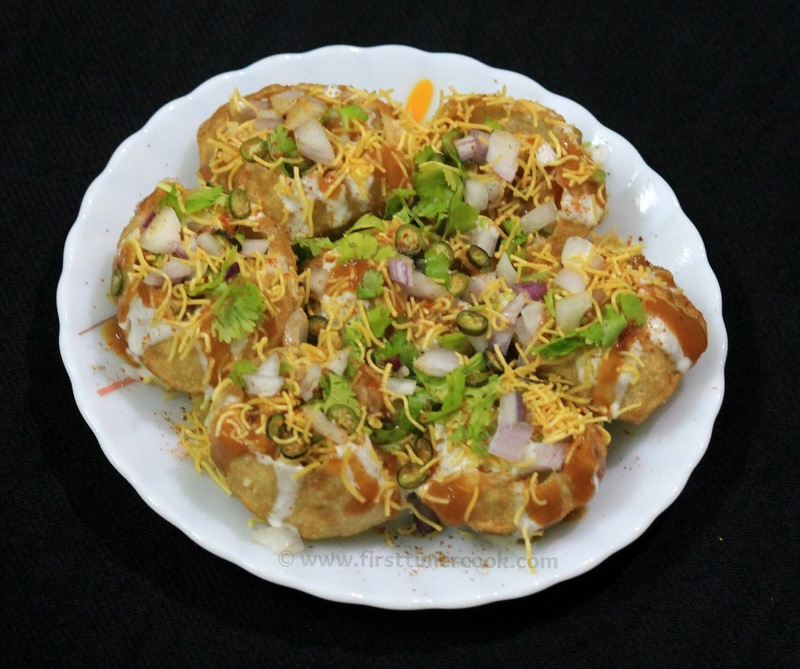 So if you want to try some different snack with the same ingredients as of golgappa, then the golgappa chat recipe'll best match. This chat is basically made by stuffing crispy puffed golgappa puris with boiled and smashed potatoes, then topping with variety of chutneys, curd, sev, onion, chat masala, roasted cumin (jeera) powder which finally results in a perfect sweet, tangy and spicy evening snack. This can be served as a good and quick snack for kitty parties or birthday parties since the ingredients are prepared in advance and just need assembling at time of serving which takes hardly 1-2 minutes per serving. So lets go in details procedure of making this perfectly balanced tongue tickling chat. In a bowl, mash the boiled potatoes with a spoon. Take one serving plate. 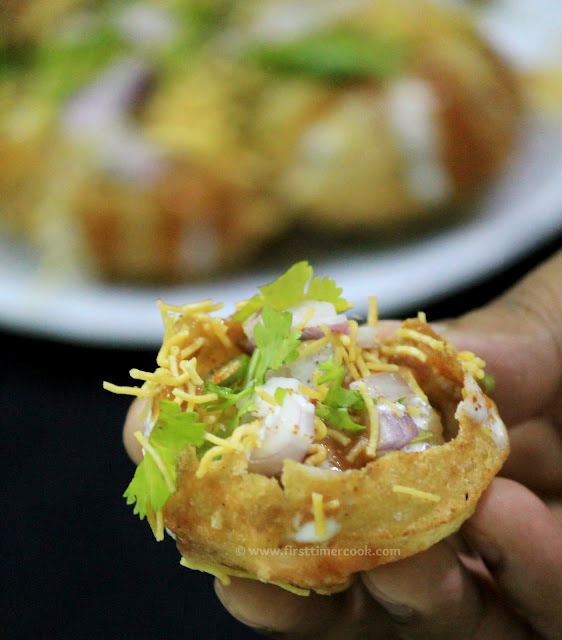 Take each golgappa puri and gently make a large hole on its top-middle side (thin side) by poking it with a spoon / finger for stuffing. Arrange them on the plate. Fill each puri with 1 tbsp of mashed potato. Then spread chopped onion and green chilies. With the help of a spoon, drizzle little amount of tamarind chutney and green chutney. Then pour some curd over each puri. Now sprinkle chat masala, roasted cumin powder, red chili powder, black salt. Finally sprinkle sev and garnish with chopped coriander leaves. Golgappa chat is ready and serve it immediately ! The amount of chutneys and curd totally depend upon choice. Add boiled black chickpeas along with potato if interested.